Photo courtesy of John W. Hoopes. Copyright ©2001 John W. Hoopes. All rights reserved. The stone balls of Costa Rica have been the object of pseudoscientific speculations since the publication of Erich von Däniken's Chariots of the Gods in 1971. More recently, they have gained renewed attention as the result of books such as Atlantis in America- Navigators of the Ancient World, by Ivar Zapp and George Erikson (Adventures Unlimited Press, 1998), and The Atlantis Blueprint: Unlocking the Ancient Mysteries of a Long-Lost Civilization, by Colin Wilson and Rand Flem-Ath (Delacorte Press, 2001). These authors have been featured on television, radio, magazines, and web pages, where they do an incredible disservice to the public by misrepresenting themselves and the state of actual knowledge about these objects. Although some of these authors are often represented as having "discovered" these objects, the fact is that they have been known to scientists since they first came to light during agricultural activities by the United Fruit Company in 1940. Archaeological investigation of the stone balls began shortly thereafter, with the first scholarly publication about them appearing in 1943. They are hardly a new discovery, nor are they especially mysterious. In fact, archaeological excavations undertaken at sites with stone balls in the 1950s found them to be associated with pottery and other materials typical of the Pre-Columbian cultures of southern Costa Rica. Whatever "mystery" exists has more to do with loss of information due to the destruction of the balls and their archaeological contexts than lost continents, ancient astronauts, or transoceanic voyages. Nobody knows for sure. The balls had ceased to be made by the time of the first Spanish explorers, and remained completely forgotten until they were rediscovered in the 1940s. Many of the balls were found to be in alignments, consisting of straight and curved lines, as well as triangles and parallelograms. One group of four balls was found to be arranged in a line oriented to magnetic north. This has led to speculation that they may have been arranged by people familiar with the use of magnetic compasses, or astronomical alignments. Unfortunately, all but a few of these alignments were destroyed when the balls were moved from their original locations, so measurements made almost fifty years ago cannot be checked for accuracy. Many of the balls, some of them in alignments, were found on top of low mounds. This has led to speculation that they may have been kept inside of houses built on top of the mounds, which would have made it difficult to use them for making observations. Ivar Zapp's suggestions that the alignments were navigational devices pointing to Easter Island and Stonehenge are almost certainly wrong. Lothrop's original measurements of alignments of balls only a few meters apart were not accurate or precise enough to allow one to control for errors in plotting such long distances. With the exception of balls located on the Isla del Caño, most of the balls are too far from the sea to have been useful to ocean-going navigators. Virtually all of the known balls have been moved from their original locations, destroying information about their archaeological contexts and possible alignments. Many of the balls have been blown up by local treasure hunters who have believed nonsensical fables that the balls contain gold. Balls sitting in agricultural fields have been damaged by periodic burning, which causes the once smooth surface of the balls to crack, split, and erode--a process that has contributed to the destruction of the largest known stone ball. Balls have been rolled into gullies and ravines, or even into underwater marine locations (as at Isla del Caño). The vast majority have been transported far from their zone of origin, separating them even further from the consciousness of the descendants of the people who made these balls. In an article in Atlantis Rising Online, George Erikson makes exaggerated claims for the size of the stone balls, writing that they are "weighing up to 30 tons and measuring up to three meters in diameter" According to Samuel Lothrop, author of the most extensive study of the balls, "A 6-foot ball is estimated at about 7.5 tons, a 4-foot ball at 3 tons and a 3-foot specimen at 1.3 tons" (1963:22). Lothrop estimated the maximum weight for ball was around 16 tons. The largest known ball measures 2.15 m in diameter, which is substantially smaller than three meters. Erikson also states that these objects "were perfect spheres to within 2 millimeters from any measurement of both their diameter and circumference." This claim is false. No one has ever measured a ball with a sufficient degree of precision to make it. Neither Ivar Zapp nor George Erikson has proposed a methodology by which such measurements could be made. Lothrop (1963:17) wrote: "To measure the rotundity we used two methods, neither completely satisfactory. When the large balls were deeply buried in the ground, it might take several days to trench around them. Hence, we exposed the upper half only and then measured two or three more diameters with tape and plumb bob. This revealed that the poorer specimens, usually with diameters ranging between 2 and 3 feet (0.6-0.9 meters), varied in diameters as much as one or 2 inches (2.5-5.1 centimeters)." It should be clear that this method assumed that the portion under ground was spherical. Lothrop also measured balls that were more completely exposed by taking up to five circumferences with a tape measure, from which he then calculated their diameters. He writes, "Evidently, the larger balls were the product of the finest craftsmanship, and they were so nearly perfect that the tape and plumb-bob measurements of diameters did not reveal imperfections. Therefore, we measured circumferences horizontally and, if possible, at a 45-degree upward slant toward the four cardinal points. We did not usually ascertain the vertical circumference as the large balls were too heavy to move. This procedure was not as easy as it sounds because several people had to hold the tape and all measurements had to be checked. As the variation in diameters was too small to be detected by eye even with a plumb bob, the diameters have been computed mathematically". The source of claims for precise measurements may stem from misinterpretations of Lothrop's tables, in which he presents the calculated diameters in meters to four decimal places. However, these are mathematically calculated estimates, not direct measurements. They have not been rounded to reflect the actual precision with which the actual measurements were taken. It should be obvious that differences "too small to be detected by eye" cannot be translated into claims about precision "to within 2 millimeters". In fact, the surfaces of the balls are not perfectly smooth, creating irregularities that plainly exceed 2 millimeters in height. As noted above, some balls are known to vary over 5 cm (50 mm) in diameter. In the photograph of the largest ball on this web site, it is clear that the surface has been badly damaged. It is therefore impossible to know how precisely formed this ball might have been. George Erikson states that "archaeologists attributed the spheres to the Chorotega Indians". No archaeologist familiar with the evidence has ever made this claim. The Chorotega were an Oto-Manguean speaking group that occupied an area of Guanacaste, near the Gulf of Nicoya in northwestern Costa Rica. The peoples who lived in the area where the balls are found were Chibchan speakers. The balls have been found in association with architectural remains, such as stone walls and pavements made of river cobbles, and both whole and broken pottery vessels that are consistent with finds at other sites associated with the Aguas Buenas and Chiriquí cultures. These are believed to represent native peoples ancestral to historical Chibchan-speaking group of southern Costa Rica. George Erikson and others have implied that the balls may date as early as 12,000 years ago. There is no evidence to support this claim. Since the balls cannot be dated directly by methods such as radiocarbon dating, which can be applied directly only to organic materials, the best way to date them is by stratigraphic context and associated artifacts. Lothrop excavated one stone ball that was located in a soil layer separated from an underlying, sherd-bearing deposit that contained pottery typical of the Aguas Buenas culture (200 BC - AD 600). In the soil immediately beneath this ball he found the broken head of a painted human figurine of the Buenos Aires Polychrome type, dated to AD 1000-1500 (examples have reportely been found associated with iron tools). This suggests the ball was made sometime between AD 600 and 1500. The Balls are "Out of Context"
Since their discovery in 1940, the vast majority of these balls have been removed from their archaeological contexts to serve as lawn ornaments across Costa Rica. Many of the balls studied by Lothrop appeared to have rolled off of nearby mounds. Several had been covered by layers of fine silt, apparently from flood deposits and natural erosion. Naturally, they are "out of context" in the sense of having few good archaeological associations. It is not unusual for authors who write about the stone balls to claim that these objects have received inadequate attention from serious scholars. While this is undoubtedly true, it is not true that these objects have been ignored. It is also not true that scholarship regarding them has been somehow hidden from the general public. The first scholarly study of the balls was undertaken by Doris Stone immediately upon their discovery by workers for the United Fruit Company. Results of her investigation were published in 1943 in American Antiquity, the leading academic journal for archaeology in the United States. Samuel Lothrop, an archaeologist on the staff of the Peabody Museum of Archaeology and Ethnography at Harvard University, undertook major fieldwork concerning the balls in 1948. The final report on his study was published by the Museum in 1963. It contains maps of sites where the balls were found, detailed descriptions of pottery and metal objects found with and near them, and many photographs, measurements, and drawings of the balls, their alignments, and their stratigraphic contexts. Additional research on the balls by archaeologist Matthew Stirling was reported in the pages of National Geographic in 1969. In the late 1970s, archaeological survey on Isla del Caño (published in 1986) revealed balls in offshore contexts. Sites with balls were investigated and reported in the 1980s by Robert Drolet in the course of surveys and excavations in the Térraba Valley. In the late 1980s and early 1990s, Claude Baudez and his students from the University of Paris returned to the locations of Lothrop's earlier fieldwork in the Diquís delta to undertake a more careful analysis of the pottery of the area, producing more refined dates for the contexts of the balls. This research was published in Spanish in 1993, with an English summary appearing in 1996. 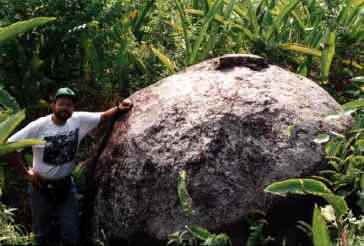 Also in the early 1990s, the author undertook fieldwork around Golfito, documenting the existence of the easternmost examples of these balls. At this time, Enrico Dal Lago, a student at the University of Kansas, defended a Master's thesis on the subject of the balls. The most careful study of the balls, however, has been fieldwork undertaken from 1990-1995 by archaeologist Ifigenia Quintanilla under the auspices of the National Museum of Costa Rica. She was able to excavate several balls in situ, documenting the process of their manufacture and their cultural associations. Quintanilla's research has been the most complete field study of these objects since Lothrop. While still mostly unpublished, the information she collected is currently the subject of her graduate research at the University of Barcelona. Even with current research pending, the list of references on this Web site makes it clear that the stone balls have received a great deal of serious, scholarly attention.